It seems that an impatient City of London Corporation isn't interested in waiting for the outcome of the judicial review of plans by the Metropolitan Police to site its Olympic operations base on Wanstead Flats. It is already eager to spend the money - the incredibly small sum - that the Met has offered for 'rental'. Consultation [see this PDF] is due to end on 31 October with local people asked to vote on four potential projects: improving the landscape around Alexandra Lake; restoring the tree avenues at Bush Wood; redeveloping the sports facility on Capel Road; and relining Jubilee Pond. The Corporation plans a display of these projects at Capel Road Football Changing Rooms this Sunday (2 October) from 12pm to 3pm and at Aldersbrook Library (date to be confirmed). 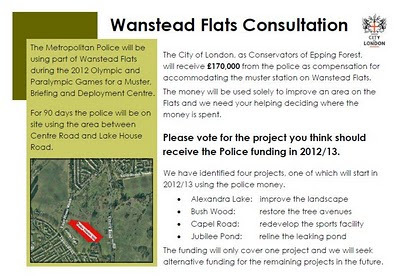 This is all part of an desperate attempt to pretend that the operations base is a positive move for Wanstead Flats - a case that the Corporation has singularly failed to convince most local people of over the last year. Is very interesting that there are projects focused on natural habitats, to recover and preserve the fauna and flora of these ecosystems. I like that the participation of citizens is important for the development of these.